The Nintendo Switch has proven an ideal home for many multiplayer experiences since its launch so when news of a Diablo-style adventure hitting the device broke, it felt like a match made in heaven. However, with so many strong releases popping up what feels like every week on the eShop, there are a lot of games vying for our hard-earned cash. Has Nine Parchments got what it takes to rise to the top of the ever-growing crowd? 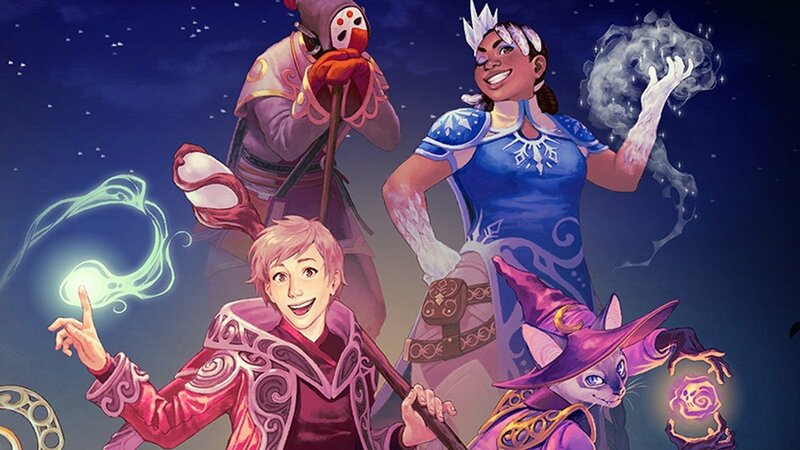 Nine Parchments’ story involves a group of aspiring wizards and their rebellious quest to go out on their own and search for magical lost parchments. It’s pretty basic stuff but sets the stage for what is to come. Their adventure will then take them across some thirty stages that include plenty of enemy confrontations and boss battles all playable with a team of up to four. The combat in Nine Parchments is best described as simplistic. Almost acting as a cross between a dungeon crawler and dual-stick shooter, you move around the world with the left analogue stick while aiming spells with the right. Each wizard starts the game with three spells at their disposal gradually unlocking more as you progress through the story. These spells come in many flavours, everything from projectiles and beams to ones that can heal your party. Not only that but each one also has an elemental effect such as fire, ice or electricity. This comes in key when facing certain enemies that may have a weakness or resistance to certain elements. Meters prevent spamming of spells so you’ll need to utilize your arsenal efficiently. You won’t be able to constantly throw down healing circles for example nor launch off fireballs at enemies like a machine gun. Balance is key; swapping spells often the best form of attack especially as the screen starts to fill with monsters. The combat is fine if a little samey and even with varying spells my tactics never really stretched far beyond attacking a little, keeping my distance and repeating said process. As you defeat enemies and unlock chests you’ll also earn experience toward levelling up your wizard. Every new level rewards you with a skill point to put into one of two skill trees. Each one of these offer upgrades to power up your magic whether it’s through areas like quicker spell regeneration or elemental resistance. It’s worth bearing in mind that if you want to try a new wizard you’ll need to level them up from scratch also. Stages themselves look great taking you from bright, colourful beaches to icy mountains. However, despite such diversity in the environments, stages end up feeling rather bland in design rarely amounting to more than a series of bigger spaces connected by bridges and paths with the occasional hidden treasure chest or feather. It’s not that they’re bad, just rather uninspired. Furthermore, the enemy designs can lack variety, many often repeated just with a different elemental power attached. These issues aren’t game-ruining but certainly become more glaringly obvious when playing on your own. The thing is Nine Parchments very much feels like a game designed for multiplayer. While braving the unknown evils on your own is certainly an option, it’s one that lacks any real excitement with the game’s repetitive combat wearing thin long before its runtime ends. Throw more wizards into the mix though and things pick up. Nine Parchments is at its most fun when working as part of a team, the constant struggle of not only dealing with enemies but also making sure not to hit your pals in friendly fire by mistake. There’s a certain level of chaotic fun to be had from trying to merge your spell’s beams together for a more powerful attack or hopping over to a fallen comrade in order to revive them as fireballs fly from a number of directions. Local multiplayer works great allowing others to drop in and out easily, and while a single Joy-Con isn’t the most comfortable way to play, it works well enough. Online also allows you to set up your own private room or simply join a random one and despite a few hiccups here and there, the process ran smooth overall. The game is full of unlockables – everything from new wizards and spells to hats and staffs many of these unlocked either by finding them in stages or completing certain tasks. Unfortunately, a lot of these extras feel underwhelming – hats, for example, offering no perks and too small to really see well amidst battle, unlockable wizards consisting mostly of slight variations on eight original designs and while the staffs may look visually different, they don’t feel it. A little more focus on the loot side of things would have really added to the game’s replayability, chests yielding unknown treasures inside as opposed to just experience. Another big problem I have with the game is that there is only ever one save file, a harsh reality I learned when trying out the online multiplayer for the first time. Joining a group would then instantly delete my single player progress I had made earlier; instead overwritten with the online game I had just taken part in. It’s a major oversight that then feels like it restricts the way you play. Your character level and unlocks do carry over sure but to lose your point in the campaign is beyond frustrating. Making it halfway through the game’s campaign again, I’d actively avoid playing online at the punishment of losing my progress. It’s a case of play it this way or the other with no room for mixing and that really hurts the game’s overall appeal. Frozenbyte has said they will update the saving system in a patch next year but for now, it’s a sore point. Nine Parchments is a perfectly fine dungeon crawler-esque experience that sadly never really manages to deliver on its true potential. While it might tick a lot of the genre checkboxes, these ideas are never expanded upon enough to help the game truly stand out. As a multiplayer adventure, there’s definitely fun to be had in working together to tackle swarms of enemies, but alone, you’ll be hard-pressed to keep engaged through to the end credits.